Paul Stamper is Senior Designation Advisor for English Heritage and is responsible for overseeing the production of our designation selection criteria guidelines. Paul is also the intellectual lead on First World War commemorative initiatives. As we move ever-closer to the centenary of the outbreak of the First World War, English Heritage is formulating plans for how it will play a part in national remembrance. Our particular focus, given our responsibilities, is the war’s impact on England, which was enormous. Perhaps surprisingly, less is known about the home defences, camps, and war factories erected in 1914-18 than it is about what was erected during the Second World War and the Cold War, and we will be working with partners across the country to remedy this. Already we are starting to compile lists of what there was – airfields, coastal defences, munitions factories, and the like – and beginning to investigate how many survive today. 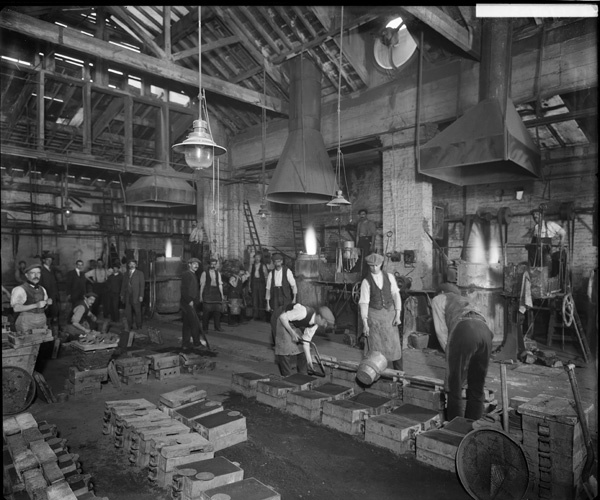 Casting metal shell components at William Sugg & Co Ltd’s Vincent Works in Westminster. Dec 1918. War memorials in all but a handful of towns and villages remind us that almost every street and family was directly engaged in the conflict, whether through service in the armed forces, or through war-work on the land or in factories. On the Western Front and elsewhere the losses were enormous: almost 900,000 British dead, and two million wounded. Over the next six years, through to 2019 when we mark the centenary of the Peace (signed seven months after the November 1918 Armistice) English Heritage will be working with bodies like the War Memorials Trust to help communities care for their war memorials, with guidance on maintenance, grant aid, and additional listings, especially of memorials which are at risk through neglect or decay. 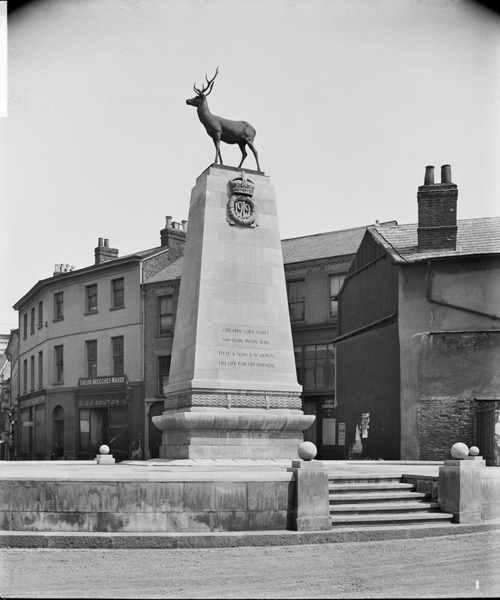 The war memorial in Hertford, Hertfordshire, designed by Sir Aston Webb, RA. The names of those who died in the Second World War were later also inscribed. Our own responsibilities include several of London’s largest and finest memorials – the Royal artillery, Machine Gun Corps and Edith Cavell memorials, together with the Cenotaph. It is hard to countenance, but the last came about almost accidentally, when in July 1919 thoughts turned to a national memorial, past which the Victory March would pass. The architect Edwin Lutyens, who had become firmly established as a designer of memorials for the Fallen through his work with the Imperial War Graves Commission (now the Commonwealth War Graves Commission) was recommended to the Prime Minister, Lloyd George, and within days he had come up with the design for a symbolic empty tomb, a Cenotaph, supported on top of a tapering pylon, to stand in the middle of London’s Whitehall. The idea was approved, and in days this was run up in wood and plaster, and painted white. Entirely unexpectedly, once the march past was over ordinary people – the mothers, widows and sweethearts of the Fallen – left wreaths around the Cenotaph’s base. A million people made pilgrimage, and tens of thousands of wreaths accumulated. Eventually the government had no choice, and by the time the Tomb of the Unknown Warrior was unveiled in Westminster Abbey on 11 November 1920, the temporary Cenotaph had been replaced by one in stone. Although regularly cleaned, almost a century’s exposure to London’s grime has taken its toll. Thus, to ensure the Cenotaph is in the best possible condition for ceremonies of national remembrance during the centenary years, summer 2013 saw English Heritage carefully cleaning the Portland stone, drawing out lichen growth with chemical poultices, and repointing the joints in the stonework with lime mortar made with ground-up Portland stone. The work will feature in a Timeteam special on Sir Edwin Lutyens, to be broadcast in 2014. 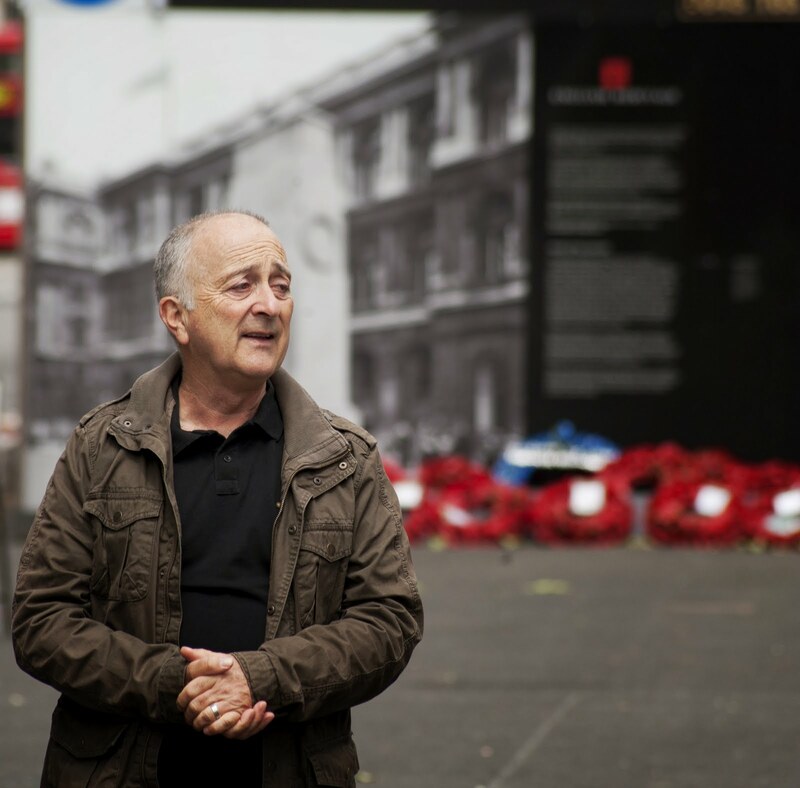 Sir Tony Robinson at the Cenotaph in June for filming with Time Team. First World War Home Front – As part of the 2014-2018 Centenary, English Heritage has initiated a major project to record the colossal ‘footprint’ left by the First World War on the fabric, landscape and coastal waters of England. You can find out more about that legacy in this new section of our website. War Memorials Online – War Memorials Trust is the charity that works for the protection and conservation of war memorials across the UK. Grants for War Memorials – This scheme is funded by English Heritage and The Wolfson Foundation and administered by War Memorials Trust.